NEW!!! We have recently started a condo project where all of our sites are now also for sale. You have the opportunity to purchase the unit (the land where the trailer sets). You may become a part owner in Tiger Musky Condominiums. The unit prices range from $39,000 to $54,000 depending on size and location. Please contact us at (715) 945-2555 if you have any questions. Consider Tiger Musky as your base in the north woods – at a fraction of what you’d pay for comparable lakeside property. 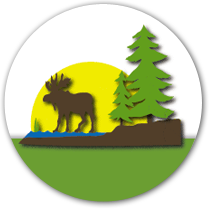 Enjoy direct access to the Chippewa Flowage from the cleanest, best-kept mobile home park. The 111 unit park adjoins Tiger Musky Resort. Together, the park and resort sit on 57 acres. As a retiree or a family, buy into a place where you’re always on vacation. Have a place to visit – or spend the entire season. We usually open late April and close in the middle of October, or as the weather permits. Rent includes sewer, water, shared boat dock, outside boat storage and very well kept grounds. Rent does not include heat or electricity. Take a look at the units below that are currently for sale. Call us at 715-945-2555 with any questions, or to request a copy of our lot lease.